Three recent genome-wide association studies (GWAS) identified several single-nucleotide polymorphisms (SNPs) with modest effects on diabetic retinopathy in Mexican-American and white patients with diabetes. This study aimed to evaluate the effects of these variants on diabetic retinopathy in Chinese patients with type 2 diabetes. A total of 1,972 patients with type 2 diabetes were recruited to this study, including 819 patients with diabetic retinopathy and 1,153 patients with diabetes of ≥5 years duration but without retinopathy. Forty SNPs associated with diabetic retinopathy in three GWAS were genotyped. Fundus photography was performed to diagnose and classify diabetic retinopathy. rs17684886 in ZNRF1 and rs599019 near COLEC12 were associated with diabetic retinopathy (OR 0.812, p = 0.0039 and OR 0.835, p = 0.0116, respectively) and with the severity of diabetic retinopathy (p = 0.0365 and p = 0.0252, respectively, for trend analysis). Sub-analysis in patients with diabetic retinopathy revealed that rs6427247 near SCYL1BP1 (also known as GORAB) and rs899036 near API5 were associated with severe diabetic retinopathy (OR 1.368, p = 0.0333 and OR 0.340, p = 0.0005, respectively). The associations between rs6427247 and rs899036 and severe diabetic retinopathy became more evident after a meta-analysis of published GWAS data (OR 1.577, p = 2.01 × 10−4 for rs6427247; OR 0.330, p = 5.84 × 10−7 for rs899036). We determined that rs17684886 and rs599019 are associated with diabetic retinopathy and that rs6427247 and rs899036 are associated with severe diabetic retinopathy in Chinese patients with type 2 diabetes. Danfeng Peng and Jie Wang contributed equally to this work. Diabetes mellitus, particularly type 2 diabetes, has reached epidemic proportions in China and other countries. As a major chronic microvascular complication of diabetes, diabetic retinopathy is the leading cause of vision loss among working-age adults around the world . The increasing prevalence of diabetes has led to an increase in the number of patients suffering from diabetic retinopathy, which represents a heavy public health burden. A meta-analysis has indicated that the global prevalence of diabetic retinopathy among patients with diabetes is 34.6% . There are approximately 93 million people with diabetic retinopathy, 17 million with proliferative diabetic retinopathy (PDR) and 28 million with vision-threatening diabetic retinopathy. Diabetic retinopathy is a multifactorial disease. Epidemiological and prospective studies have demonstrated that the duration of diabetes, poor glycaemic control and blood pressure are major risk factors for diabetic retinopathy [3, 4, 5]. Some patients with intensive glycaemic control and a shorter duration of diabetes may still develop diabetic retinopathy, whereas some are spared despite poor glycaemic control and a longer duration of diabetes . These phenomena may be explained by the genetic contributions to diabetic retinopathy. Studies have suggested a genetic influence on the development of diabetic retinopathy . One study found the same degree of severity in high concordance in twins with diabetes . A familial aggregation of diabetic retinopathy has been observed across different ethnicities. 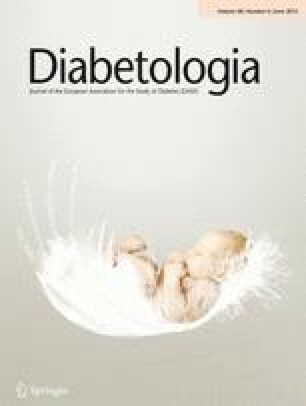 Siblings and relatives of patients with diabetic retinopathy have a significantly increased risk of diabetic retinopathy compared with siblings and relatives of patients with diabetes but without diabetic retinopathy [9, 10, 11]. This trend is even more pronounced in families exhibiting more severe diabetic retinopathy [12, 13, 14]. However, the study of the genetics of diabetic retinopathy is still in its infancy, and attempts to identify susceptible loci have been unsuccessful. Most of the genetic research into diabetic retinopathy has involved a candidate gene approach. A significant number of genes and genetic variants has been proposed through this approach (e.g. AKR1B1, VEGFA, ACE and AGER) . However, individual studies have frequently yielded inconsistent and even conflicting findings. Since 2005, genome-wide association studies (GWAS) have been widely used for complex diseases, including diabetic retinopathy but, to date, no locus for diabetic retinopathy from GWAS reaches conventional significance criteria. In 2010, a GWAS among Mexican-American families identified several single-nucleotide polymorphisms (SNPs) and genes associated with severe diabetic retinopathy at a p value of less than 0.0001 . Another genome-wide meta-analysis using Genetics of Kidney in Diabetes (GoKinD) and Epidemiology of Diabetes Intervention and Control Trial (EDIC) samples identified several SNPs at close to a genome-wide level for severe diabetic retinopathy (rs476141, p = 1.2 × 10−7; rs10521145, p = 3.4 × 10−6) . A replication analysis for severe diabetic retinopathy was conducted in a cohort of diabetic individuals from the Wisconsin Epidemiologic Study of Diabetic Retinopathy (WESDR) . The top two associations observed were for rs4865047 (p = 2.06 × 10−5) and rs1902491 (p = 2.81 × 10−5). Because the effects of these loci on diabetic retinopathy in the Chinese population are unknown, our study attempted to replicate the associations observed in these three studies in a cohort of Chinese patients with type 2 diabetes in Shanghai. This study involved 1,972 patients with type 2 diabetes recruited from the Shanghai Diabetic Complications Study  and Shanghai Diabetes Institute Inpatient Database of Shanghai Jiao Tong University Affiliated Sixth People’s Hospital [20, 21]. All participants were unrelated patients with type 2 diabetes meeting the 1999 WHO criteria. Of these patients, 819 were diagnosed with diabetic retinopathy and 1,153 had diabetes for longer than 5 years but without diabetic retinopathy and were considered as cases and controls for diabetic retinopathy, respectively. This study was approved by the institutional review board of Shanghai Jiao Tong University Affiliated Sixth People’s Hospital, and written informed consent was obtained from each participant. Fundus photography of all participants was performed according to a standardised protocol at the Department of Ophthalmology, Shanghai Jiao Tong University Affiliated Sixth People’s Hospital. Both eyes of each patient were photographed with a 45° 6.3 megapixel digital nonmydriatic camera (Canon CR6-45NM; Lake Success, NY, USA). Retinopathy was graded according to the International Classification of Diabetic Retinopathy  as follows: mild non-proliferative diabetic retinopathy (NPDR), moderate NPDR, severe NPDR or PDR. The more severely affected eye of each patient was used to classify their retinopathy status. The 24 h albumin excretion rate (AER) was used to assess nephropathy. AER was measured on three consecutive days, and the mean value was recorded for each patient. Patients with AER ≥ 30 mg/24 h were diagnosed with diabetic nephropathy. To evaluate glycaemic control the HbA1c level was measured by high-performance liquid chromatography (Variant II; Bio-Rad, Hercules, CA, USA). Blood pressure and lipid profile data were also collected for each participant. A total of 40 SNPs, including 21 SNPs reported in the Mexican-American GWAS (rs10501943, rs10519765, rs1197310, rs1445754, rs2300782, rs6427247, rs699549, rs763970, rs899036, rs599019, rs1106412, rs1033465, rs11583330, rs11635920, rs11812882, rs11927173, rs17083119, rs3014267, rs3098241, rs6726798 and rs6909083), 17 SNPs reported in the GoKinD and EDIC GWAS (rs476141, rs10521145, rs17670074, rs227455, rs238252, rs737141, rs11074904, rs11647881, rs11736136, rs151227, rs151320, rs17063155, rs17684886, rs238250, rs4941432, rs9888035 and rs11871508) and 2 SNPs reported in the WESDR replication study (rs4865047 and rs1902491), were genotyped in all participants. Genotyping was performed by primer extension of multiplex products with detection by matrix-assisted laser desorption ionisation–time of flight mass spectroscopy using a MassARRAY Compact Analyzer (Sequenom, San Diego, CA, USA). rs11871508 and rs6909083 failed during the assay design and genotyping, respectively. The genotyping data underwent a series of quality control checks and cleaned data were used in further statistical analyses. The call rate for each SNP was more than 96%. The concordance rate based on 100 duplicates was greater than 99% for all SNPs. Eighty-three individuals were excluded due to sample call rate <80%. The Hardy–Weinberg equilibrium test was performed before the statistical analysis (a two-tailed p value <0.01 was considered statistically significant), and rs238250 was excluded (p = 0.004). Another 12 SNPs (rs11583330, rs6726798, rs1106412, rs11812882, rs17063155, rs238252, rs151227, rs151320, rs10521145, rs11647881, rs11074904 and rs737141) were rare in our population (minor allele frequency <0.0015) and were excluded from statistical analyses. The allelic frequencies were compared between patients with or without diabetic retinopathy using a χ 2 test in PLINK (v1.07; http://pngu.mgh.harvard.edu/~purcell/plink/) , and ORs with 95% CIs are presented. Genotype distributions between patients with or without diabetic retinopathy were compared using logistic regression under an additive model with adjustment of confounding factors. The effects of SNPs on the levels of retinopathy severity were analysed by trend analysis. Combined ORs from different studies were calculated by Comprehensive Meta Analysis (v2.2.057; Englewood, NJ, USA) with a fixed- or random-effect model after testing for heterogeneity. The test for homogeneity was assessed by the Cochran Q test. Correction for multiple testing was performed using PLINK through 10,000 permutation tests and empirical p values are presented. The statistical analyses were performed using SAS 9.3 (SAS institute, Cary, NC, USA) unless specified otherwise. A two-tailed p value <0.05 was considered statistically significant. On the basis of an estimated effect size of genetic loci for diabetic retinopathy (~1.25), our samples had >85% power to detect an effect SNP with minor allele frequency of 0.3 and >75% power to detect an effect SNP with minor allele frequency of 0.2 at a level of significance of 0.05. The clinical characteristics of the samples that passed genotype quality control are shown in Table 1. Compared with patients without diabetic retinopathy, patients with diabetic retinopathy were younger, diagnosed with diabetes at earlier age, and had higher HbA1c and blood pressure and higher prevalence of nephropathy. We first analysed the association between SNPs and the risk of diabetic retinopathy. As shown in Table 2, rs1197310, rs4865047, rs17684886 and rs599019 were nominally associated with diabetic retinopathy (OR 1.155, 95% CI 1.013, 1.316, p = 0.0309 for the rs1197310 T allele, OR 0.854, 95% CI 0.735, 0.991, p = 0.0379 for the rs4865047 T allele, OR 0.829, 95% CI 0.729, 0.944, p = 0.0046 for the rs17684886 A allele and OR 0.832, 95% CI 0.729, 0.950, p = 0.0065 for rs599019 C allele). After adjusting for confounding factors, including the duration of diabetes, HbA1c level, systolic and diastolic blood pressure, BMI and nephropathy, rs17684886 and rs599019 still exhibited significant association with diabetic retinopathy (OR 0.812, 95% CI 0.705, 0.935, p = 0.0039, empirical p = 0.0783 for rs17684886 and OR 0.835, 95% CI 0.725, 0.961, p = 0.0116, empirical p = 0.24 for rs599019). We then analysed the effects of rs17684886 or rs599019 on the severity of diabetic retinopathy in all samples. As shown in Table 3, both SNPs were associated with the level of diabetic retinopathy, with the risk allele more frequent in patients with more severe diabetic retinopathy (p = 0.0365 for rs17684886 and p = 0.0252 for rs599019 for trend analysis). Because the 40 SNPs were reported to be possibly associated with severe diabetic retinopathy, we examined this relationship in patients with diabetic retinopathy. For severe diabetic retinopathy analysis, patients with mild NPDR (n = 485) were regarded as controls and patients with severe NPDR or PDR were regarded as cases (n = 163). As shown in Table 4, rs2300782 and rs899036 were significantly associated with severe diabetic retinopathy (OR 1.380, 95% CI 1.073, 1.777, p = 0.0121 for the rs2300782 T allele and OR 0.448, 95% CI 0.268, 0.749, p = 0.0017 for the rs899036 C allele). rs6427247 and rs10501943 were marginally associated with severe diabetic retinopathy (p = 0.0525 for rs6427247 and p = 0.0516 for rs10501943). After adjusting for the duration of diabetes, HbA1c level, systolic and diastolic blood pressure, BMI and nephropathy, rs6427247 and rs899036 were still associated with severe diabetic retinopathy (OR 1.368, 95% CI 1.025, 1.825, p = 0.0333 for rs6427247 and OR 0.340, 95% CI 0.185, 0.624, p = 0.0005 for rs899036). The association between rs899036 and severe diabetic retinopathy remained significant even after adjusting for multiple comparisons (empirical p = 0.0093). We also performed a meta-analysis with the fixed-effect model combining our data and the published GWAS data for rs6427247 and rs899036 . As shown in Table 5, the associations of these two SNPs with severe diabetic retinopathy became more evident. rs899036 showed an association with severe diabetic retinopathy that approached genome-wide significance (OR 0.330, 95% CI 0.214, 0.510, p = 5.84 × 10−7). In this study, we analysed the effects of 40 SNPs reported by GWAS on diabetic retinopathy in Chinese patients with type 2 diabetes. We determined that rs17684886 and rs599019 were associated with diabetic retinopathy in Chinese patients with type 2 diabetes after adjusting for confounding factors, with the minor allele conferring a lower risk of diabetic retinopathy (OR 0.812, p = 0.0039 for rs17684886 and OR 0.835, p = 0.0116 for rs599019). In our sub-analysis, we detected associations between rs6427247 and rs899036 and severe diabetic retinopathy after adjustment for confounding factors (OR 1.368, p = 0.0333 for rs6427247 and OR 0.340, p = 0.0005 for rs899036). However, we cannot fully exclude the possibility that the association between rs17684886 or rs599019 and diabetic retinopathy was a false-positive finding because only a trend association or no association was observed after adjusting for multiple comparisons (empirical p = 0.0783 for rs17684886 and empirical p = 0.24 for rs599019). Nevertheless, we also determined that these two SNPs were significantly associated with the severity of diabetic retinopathy (p = 0.0365 for rs17684886 and p = 0.0252 for rs599019 for trend analysis), further supporting a role for them in diabetic retinopathy and limiting the possibility of a false positive. Besides, risk alleles of rs17684886 and rs59919 for diabetic retinopathy are the same as those reported for severe diabetic retinopathy in previous GWAS [16, 17] and the association of rs6427247 and rs899019 with severe diabetic retinopathy in our study is in agreement with the results of previous GWAS . The four variants associated with diabetic retinopathy or severe diabetic retinopathy in our study are located in the noncoding regions—rs17684886 is an intron SNP of ZNRF1 and the other three SNPs are located in intergenic regions: rs599019 is located downstream of COLEC12; rs6427247 is located upstream of SCYL1BP1 (also known as GORAB) and rs899036 is located upstream of API5. To date, 43% of all trait-associated SNPs identified in GWAS studies are located in intergenic regions . However, the intergenic SNPs may have an impact on neighbouring gene function. ZNRF1 encodes an E3 ubiquitin-protein ligase that plays a role in neural-cell differentiation. It has been reported to interact with tubulin, promote Wallerian degeneration and regulate Na+/K+ ATPase [25, 26, 27]. COLEC12 encodes a member of the C-lectin family. This protein is an endothelial cell surface receptor that displays several functions associated with host defence [28, 29]. SCYL1BP1 encodes SCY1-like 1-binding protein 1, a regulator of the p53 pathway with tumour-suppressive function [30, 31, 32]. API5 encodes the protein apoptosis inhibitor 5, which is reported to be a suppressor of apoptosis and to play a key role in tumour progression [33, 34]. However, the relationships of these SNPs and other genes are largely unknown. Thus, additional studies are needed to identify the causal loci and genes and to elucidate the underlying mechanism of diabetic retinopathy. This study has a number of limitations. First, the small sample size was insufficient to identify SNPs with smaller effects on diabetic retinopathy. Second, we did not adjust for lifestyle factors, such as alcohol consumption and cigarette smoking, as confounding factors. Whether there is an interaction between lifestyle and these genetic variants on diabetic retinopathy remains unknown. Third, we could not entirely exclude population stratification in patients with and without diabetic retinopathy as a potential source of bias and incorrect inferences in genotype–disease association. The effect of population stratification may be minimal in the current study, however, as all the participants were recruited from the same geographic area with the same ancestry. Hence, studies with a larger sample size are needed to further replicate the associations identified in our study of a Chinese population. In summary, we determined that rs17684886 in ZNRF1 and rs599019 near COLEC12 were associated with the risk of diabetic retinopathy and that rs6427247 near SCYL1BP1 and rs899036 near API5 were associated with the risk of severe diabetic retinopathy in Chinese patients with type 2 diabetes. Additional studies are needed to replicate this finding. The authors are grateful to the patients who participated in this research and gratefully acknowledge the skilful technical support of the nursing and medical staff at the Shanghai Clinical Centre for Diabetes and Department of Endocrinology and Metabolism. This work was supported by grants from the national 973 programme (2011CB504001), the National Science Foundation of China (81200582, 81322010 and 81170735), the national 863 programme (2012AA02A509), the Shanghai Talent Development Grant (2012041) and the Excellent Young Medical Expert of Shanghai (XYQ2011041). DP and JW performed the majority of the analyses and drafted the manuscript. RZ, FJ and ST participated in the design of the study. MC, JY, XS, SW, TW and DY participated in the data analysis. YB provided helpful comments on study design and data analysis. CH and WJ conceived the study, participated in its design and helped to draft the manuscript. All authors contributed to the drafting or critical revision of the manuscript for important intellectual content. All authors read and approved the final manuscript. CH and WJ are the guarantors of this work.